"Guan Gong" redirects here. For other uses, see Guan Gong (disambiguation). This is a Chinese name; the family name is Guan. ^1 See General worship for more posthumous titles. Guan Yu (died 220 CE), courtesy name Yunchang, was a general serving under the warlord Liu Bei in the late Eastern Han dynasty. He played a significant role in the civil war that led to the collapse of the dynasty and the establishment of the state of Shu Han – founded by Liu Bei – in the Three Kingdoms period. After Liu Bei gained control of Yi Province in 214 CE, Guan Yu remained in Jing Province to govern and defend the area for about seven years. In 219 CE, while he was away fighting Cao Cao's forces at the Battle of Fancheng, Liu Bei's ally Sun Quan broke the Sun–Liu alliance and sent his general Lü Meng to invade and conquer Liu Bei's territories in Jing Province in a stealth operation. By the time Guan Yu found out about the loss of Jing Province after his defeat at Fancheng, it was too late. He was subsequently captured in an ambush by Sun Quan's forces and executed. As one of the best known Chinese historical figures throughout East Asia, Guan's true life stories have largely given way to fictionalised ones, most of which are found in the historical novel Romance of the Three Kingdoms or passed down the generations, in which his deeds and moral qualities have been lionised. Guan is respected as an epitome of loyalty and righteousness. Guan Yu was deified as early as the Sui dynasty and is still worshipped by many Chinese people today in mainland China, Taiwan, Hong Kong, and among many overseas Chinese communities. In religious devotion he is reverentially called the "Divus Guan" (Guāndì) or "Lord Guan" (Guāngōng). He is a deity worshipped in Chinese folk religion, popular Confucianism, Taoism, and Chinese Buddhism, and small shrines to Guan are almost ubiquitous in traditional Chinese shops and restaurants. His hometown Yuncheng has also named its airport after him. The authoritative historical source on Guan Yu's life is the Records of the Three Kingdoms (Sanguozhi), which was written by Chen Shou in the third century. During the fifth century, Pei Songzhi annotated the Sanguozhi by incorporating information from other sources to Chen Shou's original work and adding his personal commentary. Some alternative texts used in the annotations to Guan Yu's biography include: Shu Ji (Records of Shu), by Wang Yin; Wei Shu (Book of Wei), by Wang Shen, Xun Yi and Ruan Ji; Jiang Biao Zhuan, by Yu Pu; Fu Zi, by Fu Xuan; Dianlue, by Yu Huan; Wu Li (History of Wu), by Hu Chong; Chronicles of Huayang, by Chang Qu. Xuande took a glance at the man, who stood at a height of nine chi,[lower-alpha 1] and had a two chi[lower-alpha 2] long beard; his face was of the colour of a zao,[lower-alpha 3] with red lips; his eyes were like that of a phoenix's,[lower-alpha 4] and his eyebrows resembled silkworms. [lower-alpha 5] He had a dignified aura and looked quite majestic. Alternatively, the idea of his red face could have been borrowed from opera representation, where red faces depict loyalty and righteousness. In illustrations of Romance of the Three Kingdoms, Guan Yu is traditionally depicted wearing a green robe over his body armour. Supposedly, Guan Yu's weapon was a guan dao named Green Dragon Crescent Blade, which resembled a glaive and was said to weigh 82 catties (about 18.25 kg or 40 lbs). A wooden replica can be found today in the Emperor Guan Temple in Xiezhou County, Shanxi. Guan Yu captures Pang De, as depicted in a Ming dynasty painting by Shang Xi, c. 1430. Sun Quan sent Guan Yu's head to Cao Cao, who arranged a noble's funeral for Guan and had the head properly buried with full honours. [Sanguozhi zhu 11] In 260, Liu Shan granted Guan Yu the posthumous title of "Marquis Zhuangmou" (壯繆侯),[Sanguozhi 18][Sanguozhi others 15] which implied that Guan did not live up to his name in terms of his ability. Guan Yu had two known sons – Guan Ping and Guan Xing. Guan Xing inherited his father's title "Marquis of Hanshou Village" (漢壽亭侯) and served in the state of Shu during the Three Kingdoms period. [Sanguozhi 22] Guan Yu also had a daughter. Sun Quan once proposed a marriage between his son and Guan Yu's daughter, but Guan rejected the proposal. Her name was not recorded in history, but she was known as "Guan Yinping" (關銀屏) or "Guan Feng" (關鳳) in folktales and Chinese opera. Guan Yu allegedly had a third son, Guan Suo, who is not mentioned in historical texts and appears only in folklore and the historical novel Romance of the Three Kingdoms. In 1719, the Kangxi Emperor of the Qing dynasty awarded the hereditary title "Wujing Boshi" (五經博士; "Professor of the Five Classics") to Guan Yu's descendants living in Luoyang. The bearer of the title is entitled to an honorary position in the Hanlin Academy. A 19th-century Japanese woodcut of Guan Yu by Utagawa Kuniyoshi. In this scene, he is being attended to by the physician Hua Tuo while playing weiqi. See here for a large version of the full picture. Luo Guanzhong's historical novel Romance of the Three Kingdoms glorified Guan Yu by portraying him as a righteous and loyal warrior. Guan Yu was one of the most altered and aggrandised characters in the novel, which accounted for his popular image in Chinese society. Guan Yu was deified as early as the Sui dynasty (581–618), and is still worshipped today among the Chinese people. 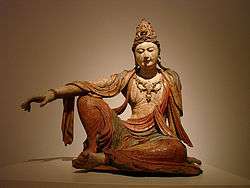 He is variedly worshipped as an indigenous Chinese deity, a bodhisattva in Buddhist tradition and as a guardian deity in Taoism and many other religious bodies. He is also held in high esteem in Confucianism. These roles are not necessarily contradictory or even distinguished within the Chinese religious system, which often merge multiple ancient philosophies and religions. In the Western world, Guan Yu is sometimes called the Taoist God of War, probably because he is one of the most well-known military generals worshipped by the Chinese people. This is a misconception of his role, as, unlike the Greco-Roman deity Mars or the Norse god Týr, Guan Yu, as a god, does not necessarily bless those who go to battle, but rather people who observe the code of brotherhood and righteousness. Altar of Guan Yu at a restaurant in Beijing. Altar of Guan Yu in Osaka. In general worship, Guan Yu is widely referred to as "Divus Guan" (關帝; Guān Dì) and "Lord Guan" (關公; Guān Gōng), while his Taoist title is "Holy Ruler Deity Guan" (關聖帝君; Guān Shèng Dì Jūn). Temples and shrines dedicated exclusively to Guan Yu can be found across mainland China, Hong Kong, Macau, Taiwan, and other places with Chinese influence such as Vietnam, South Korea and Japan. Some of these temples, such as the Guandi Temple in Xiezhou (解州), Shanxi, were built exactly in the layout of an imperial residence, befitting his status as a "ruler". The apotheosis of Guan Yu occurred in stages, as he was given ever higher posthumous titles. Liu Shan, the second emperor of Shu, gave Guan Yu the posthumous title of "Marquis Zhuangmou" (壯繆侯) four decades after his death. During the Song dynasty, Emperor Huizong bestowed upon Guan Yu the title "Duke Zhonghui" (忠惠公), and later the title of a prince. In 1187, during the reign of Emperor Xiaozong, Guan Yu was established as "Prince Zhuangmou Yiyong Wu'an Yingji" (壯繆義勇武安英濟王). After the Song dynasty was annihilated by the Mongols, who established the Yuan dynasty in China, Guan Yu was renamed "Prince of Xianling Yiyong Wu'an Yingji" (顯靈義勇武安英濟王) by Emperor Wenzong. The elevation of Guan Yu's status to that of a deity took place during the Ming dynasty. In 1614, the Wanli Emperor bestowed on Guan Yu the title "Holy Divus Guan, the Great God Who Subdues Demons in the Three Worlds and Whose Awe Spreads Far and Moves Heaven" (三界伏魔大神威遠震天尊關聖帝君). During the Qing dynasty, the Shunzhi Emperor gave Guan Yu the title of "Guan, the Loyal and Righteous God of War, the Holy Great Deity" (忠義神武關聖大帝) in 1644. This title was expanded to "Guan the Holy Great Deity; God of War Manifesting Benevolence, Bravery and Prestige; Protector of the Country and Defender of the People; Prow and Honest Supporter of Peace and Reconciliation; Promoter of Morality, Loyalty and Righteousness" (仁勇威顯護國保民精誠綏靖翊贊宣德忠義神武關聖大帝), a total of 24 Chinese characters, by the mid-19th century. It is often shortened to "Saint of War" (武聖; Wǔ Shèng), which is of the same rank as Confucius, who is honoured the "Saint of Culture" (文聖; Wén Shèng). The Qing advancement of Guan Yu served to strengthen the loyalty of Mongol tribes, as the Mongols revered him as second only to their lamas. Throughout history, Guan Yu has also been credited with many military successes. In the 14th century, his spirit was said to have aided Zhu Yuanzhang, the founder of the Ming dynasty, at the Battle of Lake Poyang. In 1402, when Zhu Di launched a coup d'état and successfully deposed his nephew, the Jianwen Emperor. Zhu Di claimed that he was blessed by the spirit of Guan Yu. 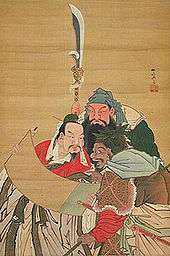 During the last decade of the 16th century, Guan Yu was also credited with the repulse of Japanese invasion of Korea by Toyotomi Hideyoshi. The Manchu imperial clan of the Qing dynasty was also associated with Guan Yu's martial qualities. During the 20th century, Guan Yu was worshipped by the warlord Yuan Shikai, president and later a short-lived emperor of China. Today, Guan Yu is still widely worshipped by the Chinese, and many shrines to him are found in homes, businesses and fraternal organisations. In Hong Kong, a shrine to Guan Yu can be found in every police station. Though by no means mandatory, Chinese police officers worship and pay respect to him. Although seemingly ironic, members of the triads and Heaven and Earth Society worship Guan Yu as well. Statues used by triads tend to hold the halberd in the left hand, and statues in police stations tend to hold the halberd in the right hand. This signifies which side Guan Yu is worshipped, by the righteous people or vice versa. The appearance of Guan Yu's face for the triads is usually more stern and threatening than the usual statue. This exemplifies the Chinese belief that a code of honour, epitomised by Guan Yu, exists even in the criminal underworld. In Hong Kong, Guan Yu is often referred to as "Yi Gor" (二哥; Cantonese for "second elder brother") for he was second to Liu Bei in their fictional sworn brotherhood. Guan Yu is also worshipped by Chinese businessmen in Shanxi, Hong Kong, Macau and Southeast Asia as an alternative wealth god, since he is perceived to bless the upright and protect them from the wicked. Another reason is related to the release of Cao Cao during the Huarong Trail incident, in which he let Cao and his men pass through safely. For that, he was perceived to be able to extend the lifespan of people in need. Among the Cantonese people who emigrated to California during the mid-19th century, the worship of Guan Yu was an important element. Statues and tapestry images of the god can be found in a number of historical California joss houses (a local term for Chinese folk religion temples), where his name may be given with various Anglicised spellings, including: Kwan Dai, Kwan Tai or Kuan Ti for Guan Di (Divus Guan); Kuan Kung for Guan Gong (Lord Guan), Wu Ti or Mo Dai for Wu Di (War Deity), Kuan Yu, Kwan Yu, or Quan Yu for Guan Yu. The Mendocino Joss House, a historical landmark also known as Mo Dai Miu (Wudimiao, i.e. the Temple of the Deity of War), or Temple of Kwan Tai, built in 1852, is a typical example of the small shrines erected to Guan Yu in the United States. Apart from general worship, Guan Yu is also commemorated in China with colossal statues such as the 1,320-tonne sculpture in Jingzhou City, Hubei Province, standing at 58 metres. In Chinese folk religion, Guan Yu is also worshipped as a menshen ("door god"), with portraits of him being pasted on doors to ward off evil spirits. 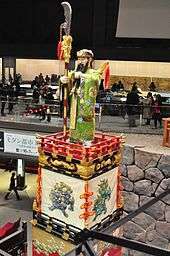 Cart for Shinto procession with Guan Yu statue from the Kanda Shrine, now preserved at the Edo-Tokyo Museum. Guan Yu is revered as "Holy Ruler Deity Guan" (關聖帝君; Guān Shèng Dì Jūn) and a leading subduer of demons in Taoism. 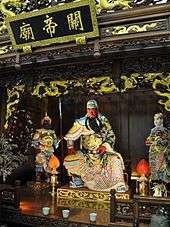 Taoist worship of Guan Yu began during the Song dynasty. Legend has it that during the second decade of the 12th century, the saltwater lake in present-day Xiezhou County gradually ceased to yield salt. Emperor Huizong then summoned Zhang Jixian (張繼先), a 30th-generation descendant of Zhang Daoling, to investigate the cause. The emperor was told that the disruption was the work of Chi You, a deity of war. Zhang Jixian then recruited the help of Guan Yu, who battled Chi You over the lake and triumphed, whereupon the lake resumed salt production. Emperor Huizong then bestowed upon Guan Yu the title "Immortal of Chongning" (崇寧真君; Chóngníng Zhēnjūn), formally introducing the latter as a deity into Taoism. In the early Ming dynasty, the 42nd Celestial Master, Zhang Zhengchang (張正常), recorded the incident in his book Lineage of the Han Celestial Masters (漢天師世家), the first Taoist classic to affirm the legend. Today, Taoist practices are predominant in Guan Yu worship. Many temples dedicated to Guan Yu, including the Emperor Guan Temple in Xiezhou County, show heavy Taoist influence. Every year, on the 24th day of the sixth month on the lunar calendar (legendary birthday of Guan Yu, Guan was actually born on the 22nd day of the sixth month of 160), a street parade in the honour of Guan Yu would also be held. Imperial thangka of the Qianlong Emperor (1736–95) depicting Guan Yu as Sangharama Bodhisattva. In Chinese Buddhism, Guan Yu is revered by most practising Buddhists as Sangharama Bodhisattva (伽蓝菩萨; 伽藍菩薩; Qiélán Púsà) a heavenly protector of the Buddhist dharma. Sangharama in Sanskrit means 'community garden' (sangha, community + arama, garden) and thus 'monastery'. The term Sangharama also refer to the dharmapala class of devas and spirits assigned to guard the Buddhist monastery, the dharma, and the faith itself. Over time and as an act of syncreticism, Guan Yu was seen as the representative guardian of the temple and the garden in which it stands. His statue traditionally is situated in the far left of the main altar, opposite his counterpart Skanda. 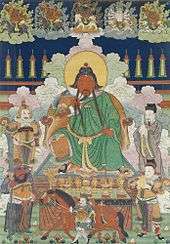 According to Buddhist legends, in 592, Guan Yu manifested himself one night before the Zen master Zhiyi, the founder of the Tiantai school of Buddhism, along with a retinue of spiritual beings. Zhiyi was then in deep meditation on Yuquan Hill (玉泉山) when he was distracted by Guan Yu's presence. Guan Yu then requested the master to teach him about the dharma. After receiving Buddhist teachings from the master, Guan Yu took refuge in the triple gems and also requested the Five Precepts. Henceforth, it is said that Guan Yu made a vow to become a guardian of temples and the dharma. Legends also claim that Guan Yu assisted Zhiyi in the construction of the Yuquan Temple (玉泉寺), which still stands today. 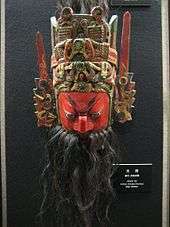 A Qing dynasty opera mask of Guan Yu. Guan Yu appears in Chinese operas such as Huarong Trail, Red Cliffs, and other excerpts from Romance of the Three Kingdoms. His costume is a green military opera uniform with armour covering his right arm and the knees of his pants. The actor's face is painted red with a few black lines, to represent honour and courage. He also wears a long three-section black beard made of yak hair and carries the Green Dragon Crescent Blade. Traditionally, after the show ends, the actor has to wash his face, burn joss paper, light incense, and pray to Chinese deities. Notable actors who have portrayed Guan Yu in film and television include: Lu Shuming, in Romance of the Three Kingdoms (1994); Wang Yingquan, in The Legend of Guan Gong (2004); Ti Lung, in Three Kingdoms: Resurrection of the Dragon (2008); Ba Sen, in Red Cliff (2008–2009); Yu Rongguang, in Three Kingdoms (2010); Donnie Yen, in The Lost Bladesman (2011). Films which make references to Guan Yu include: Stephen Chow's comedy film From Beijing with Love (1994), which, in one scene, refers to the story of Hua Tuo performing surgery on Guan Yu's arm; Zhang Yimou's Riding Alone for Thousands of Miles (2005), in which the fictional story of Guan Yu slaying six generals and crossing five passes forms a major part of the narrative; the horror comedy film My Name Is Bruce (2007), where Guan Yu's vengeful spirit is accidentally set free by a group of teenagers and he begins to terrorise their town. Guan Yu is referenced in the manga Battle Vixens (as a schoolgirl Kan-u Unchou) and BB Senshi Sangokuden (as ZZ Gundam, who is portrayed as Guan Yu Gundam). Guan Yu appears as a playable character in many video games based on Romance of the Three Kingdoms which are produced by Koei, including: the strategy game series of the same title as the novel; the action game series Dynasty Warriors and Warriors Orochi. Other non-Koei titles in which he also appears include: Puzzle & Dragons; Sango Fighter; Destiny of an Emperor; Atlantica Online; Smite. He is also referenced in Emperor: Rise of the Middle Kingdom, Titan Quest, and Koihime Musō. Guan Yu is referenced in the Portal Three Kingdoms of the card game Magic: The Gathering on a playable card. He also appears in the History Channel's Anachronism card game. ↑ In the Eastern Han dynasty, one chi was approximately 23.1 cm, nine chi was approximately 2.079 metres (6 feet, 9.85 inches). Hulsewé, A. F. P. "Han measures." T'oung pao Archives, Vol. XLIX, Livre 3, 1961, pp. 206–207. ↑ His face had a dark red hue to it, like the colour of dark jujube fruit. ↑ They were long and tapered. ↑ The title of marquis was divided into three grades during the Han dynasty and Three Kingdoms period. These are, in ascending order of prestige, tinghou (亭侯; marquis of a village), xianghou (郷侯; marquis of a district) and xianhou (縣侯; marquis of a county). Guan Yu's was the first. ↑ See Lü Meng#Invasion of Jing Province for details. ↑ Guoshi (國士) could loosely translated as "gentleman of the state". It referred to persons who had made very outstanding contributions to their countries. See the dictionary definition of 國士. ↑ (關羽字雲長，本字長生，河東解人也。) Sanguozhi vol. 36. ↑ (亡命奔涿郡。先主於鄉里合徒衆，而羽與張飛為之禦侮。) Sanguozhi vol. 36. ↑ (先主為平原相，以羽、飛為別部司馬，分統部曲。先主與二人寢則同牀，恩若兄弟。而稠人廣坐，侍立終日，隨先主周旋，不避艱險。) Sanguozhi vol. 36. ↑ (先主之襲殺徐州刺史車冑，使羽守下邳城，行太守事，而身還小沛。) Sanguozhi vol. 36. ↑ (建安五年，曹公東征，先主奔袁紹。曹公禽羽以歸，拜為偏將軍，禮之甚厚。) Sanguozhi vol. 36. ↑ (紹遣大將軍顏良攻東郡太守劉延於白馬，曹公使張遼及羽為先鋒擊之。羽望見良麾蓋，策馬刺良於萬衆之中，斬其首還，紹諸將莫能當者，遂解白馬圍。曹公即表封羽為漢壽亭侯。) Sanguozhi vol. 36. ↑ (初，曹公壯羽為人，而察其心神無乆留之意，謂張遼曰：「卿試以情問之。」旣而遼以問羽，羽歎曰：「吾極知曹公待我厚，然吾受劉將軍厚恩，誓以共死，不可背之。吾終不留，吾要當立效以報曹公乃去。」遼以羽言報曹公，曹公義之。) Sanguozhi vol. 36. ↑ (及羽殺顏良，曹公知其必去，重加賞賜。羽盡封其所賜，拜書告辭，而奔先主於袁軍。左右欲追之，曹公曰：「彼各為其主，勿追也。」) Sanguozhi vol. 36. ↑ (從先主就劉表。) Sanguozhi vol. 36. ↑ (表卒，曹公定荊州，先主自樊將南渡江，別遣羽乘船數百艘會江陵。曹公追至當陽長阪，先主斜趣漢津，適與羽船相值，共至夏口。) Sanguozhi vol. 36. ↑ (孫權遣兵佐先主拒曹公，曹公引軍退歸。先主收江南諸郡，乃封拜元勳，以羽為襄陽太守、盪寇將軍，駐江北。) Sanguozhi vol. 36. ↑ (先主西定益州，拜羽董督荊州事。) Sanguozhi vol. 36. ↑ (二十四年，先主為漢中王，拜羽為前將軍，假節鉞。是歲，羽率衆攻曹仁於樊。曹公遣于禁助仁。秋，大霖雨，漢水汎溢，禁所督七軍皆沒。禁降羽，羽又斬將軍龐德。梁郟、陸渾羣盜或遙受羽印號，為之支黨，羽威震華夏。) Sanguozhi vol. 36. ↑ (曹公議徙許都以避其銳，司馬宣王、蔣濟以為關羽得志，孫權必不願也。可遣人勸權躡其後，許割江南以封權，則樊圍自解。曹公從之。先是，權遣使為子索羽女，羽罵辱其使，不許婚，權大怒。) Sanguozhi vol. 36. ↑ (而曹公遣徐晃救曹仁，羽不能克，引軍退還。) Sanguozhi vol. 36. ↑ (又南郡太守麋芳在江陵，將軍傅士仁屯公安，素皆嫌羽自輕己。羽之出軍，芳、仁供給軍資不悉相救。羽言「還當治之」，芳、仁咸懷懼不安。於是權陰誘芳、仁，芳、仁使人迎權。) Sanguozhi vol. 36. ↑ (權已據江陵，盡虜羽士衆妻子，羽軍遂散。權遣將逆擊羽，斬羽及子平于臨沮。) Sanguozhi vol. 36. ↑ (追謚羽曰壯繆侯。) Sanguozhi vol. 36. ↑ (羽聞馬超來降，舊非故人，羽書與諸葛亮，問超人才可誰比類。亮知羽護前，乃荅之曰：「孟起兼資文武，雄烈過人，一世之傑，黥、彭之徒，當與益德並驅爭先，猶未及髯之絕倫逸羣也。」) Sanguozhi vol. 36. ↑ (羽省書大恱，以示賔客。) Sanguozhi vol. 36. ↑ (羽甞為流矢所中，貫其左臂，後創雖愈，每至陰雨，骨常疼痛，醫曰：「矢鏃有毒，毒入于骨，當破臂作創，刮骨去毒，然後此患乃除耳。」羽便伸臂令醫劈之。時羽適請諸將飲食相對，臂血流離，盈於盤器，而羽割炙引酒，言笑自若。) Sanguozhi vol. 36. ↑ (子興嗣。興字安國，少有令問，丞相諸葛亮深器異之。弱冠為侍中、中監軍，數歲卒。) Sanguozhi vol. 36. ↑ (子統嗣，尚公主，官至虎賁中郎將。卒，無子，以興庶子彝續封。) Sanguozhi vol. 36. ↑ (評曰：關羽、張飛皆稱萬人之敵，為世虎臣。羽報效曹公，飛義釋嚴顏，並有國士之風。然羽剛而自矜，飛暴而無恩，以短取敗，理數之常也。) Sanguozhi vol. 36. ↑ (靈帝末，黃巾起，州郡各舉義兵，先主率其屬從校尉鄒靖討黃巾賊有功，除安喜尉。) Sanguozhi vol. 32. ↑ (先主據下邳。靈等還，先主乃殺徐州刺史車冑，留關羽守下邳，而身還小沛。) Sanguozhi vol. 32. ↑ (五年，曹公東征先主，先主敗績。曹公盡收其衆，虜先主妻子，并禽關羽以歸。) Sanguozhi vol. 32. ↑ (曹公與袁紹相拒於官渡，汝南黃巾劉辟等叛曹公應紹。紹遣先主將兵與辟等略許下。關羽亡歸先主。曹公遣曹仁將兵擊先主，先主還紹軍，陰欲離紹，乃說紹南連荊州牧劉表。紹遣先主將本兵復至汝南，與賊龔都等合，衆數千人。 ... 曹公旣破紹，自南擊先主。先主遣麋笁、孫乾與劉表相聞，表自郊迎，以上賔禮待之，益其兵，使屯新野。) Sanguozhi vol. 32. ↑ (聞先主已過，曹公將精騎五千急追之，一日一夜行三百餘里，及於當陽之長坂。) Sanguozhi vol. 32. ↑ (後從平荊州，留屯襄陽，擊關羽、蘇非等，皆走之， ...) Sanguozhi vol. 17. ↑ (與樂進討關羽於尋口，有功 ... 又攻羽輜重於漢津，燒其船於荊城。) Sanguozhi vol. 18. ↑ (及羽與肅鄰界，數生狐疑，疆埸紛錯，肅常以歡好撫之。備旣定益州，權求長沙、零、桂，備不承旨，權遣呂蒙率衆進取。備聞，自還公安，遣羽爭三郡。) Sanguozhi vol. 54. ↑ (羽號有三萬人，自擇選銳士五千人，投縣上流十餘里淺瀨，云欲夜涉渡。肅與諸將議。 ... 肅便選千兵益寧，寧乃夜往。羽聞之，住不渡，而結柴營，今遂名此處為關羽瀨。) Sanguozhi vol. 55. ↑ (備遂割湘水為界，於是罷軍。) Sanguozhi vol. 54. ↑ (賊圍頭有屯，又別屯四冢。晃揚聲當攻圍頭屯，而密攻四冢。羽見四冢欲壞，自將步騎五千出戰，晃擊之，退走，遂追陷與俱入圍，破之，或自投沔水死。) Sanguozhi vol. 17. ↑ (羽果信之，稍撤兵以赴樊。魏使于禁救樊，羽盡禽禁等，人馬數萬，託以糧乏，擅取湘關米。權聞之，遂行，先遣蒙在前。蒙至尋陽，盡伏其精兵中，使白衣搖櫓，作商賈人服，晝夜兼行，至羽所置江邊屯候，盡收縛之，是故羽不聞知。遂到南郡，士仁、麋芳皆降。) Sanguozhi vol. 54. ↑ (會權尋至，羽自知孤窮，乃走麥城，西至漳鄉，衆皆委羽而降。權使朱然、潘璋斷其徑路，即父子俱獲，荊州遂定。) Sanguozhi vol. 54. ↑ (權征關羽，璋與朱然斷羽走道，到臨沮，住夾石。璋部下司馬馬忠禽羽，并羽子平、都督趙累等。) Sanguozhi vol. 55. ↑ ([景耀]三年秋九月，追謚故將軍關羽、張飛、馬超、龐統、黃忠。) Sanguozhi vol. 33. ↑ (江表傳云：羽好左氏傳，諷誦略皆上口。) Jiang Biao Zhuan annotation in Sanguozhi vol. 36. ↑ (魏書云：以羽領徐州。) Wei Shu annotation in Sanguozhi vol. 36. ↑ (傅子曰：遼欲白太祖，恐太祖殺羽，不白，非事君之道，乃歎曰：「公，君父也；羽，兄弟耳。」遂白之。太祖曰：「事君不忘其本，天下義士也。度何時能去？」遼曰：「羽受公恩，必立效報公而後去也。」) Fu Zi annotation in Sanguozhi vol. 36. ↑ (臣松之以為曹公知羽不留而心嘉其志，去不遣追以成其義，自非有王霸之度，孰能至於此乎？斯實曹氏之休美。) Pei Songzhi's annotation in Sanguozhi vol. 36. ↑ (蜀記曰：羽初出軍圍樊，夢豬嚙其足，語子平曰：「吾今年衰矣，然不得還！」) Shu Ji annotation in Sanguozhi vol. 36. ↑ (蜀記曰：羽與晃宿相愛，遙共語，但說平生，不及軍事。須臾，晃下馬宣令：「得關雲長頭，賞金千斤。」羽驚怖，謂晃曰：「大兄，是何言邪！」晃曰：「此國之事耳。」) Shu Ji annotation in Sanguozhi vol. 36. ↑ (典略曰：羽圍樊，權遣使求助之，勑使莫速進，又遣主簿先致命於羽。羽忿其淹遲，又自已得于禁等，乃罵曰：「狢子敢爾，如使樊城拔，吾不能滅汝邪！」權聞之，知其輕己，偽手書以謝羽，許以自往。) Dianlue annotation in Sanguozhi vol. 36. ↑ (臣松之以為荊、吳雖外睦，而內相猜防，故權之襲羽，潛師密發。按呂蒙傳云：「伏精兵於之中，使白衣搖櫓，作商賈服。」以此言之，羽不求助於權，權必不語羽當往也。若許相援助，何故匿其形迹乎？) Pei Songzhi's annotation in Sanguozhi vol. 36. ↑ (蜀記曰：權遣將軍擊羽，獲羽及子平。權欲活羽以敵劉、曹，左右曰：「狼子不可養，後必為害。曹公不即除之，自取大患，乃議徙都。今豈可生！」乃斬之。) Shu Ji annotation in Sanguozhi vol. 36. ↑ (臣松之桉吳書：孫權遣將潘璋逆斷羽走路，羽至即斬，且臨沮去江陵二三百里，豈容不時殺羽，方議其生死乎？又云「權欲活羽以敵劉、曹」，此之不然，可以絕智者之口。) Pei Songzhi's annotation in Sanguozhi vol. 36. ↑ (吳歷曰：權送羽首於曹公，以諸侯禮葬其屍骸。) Wu Li annotation in Sanguozhi vol. 36. ↑ (蜀記曰：曹公與劉備圍呂布於下邳，關羽啟公，布使秦宜祿行求救，乞娶其妻，公許之。臨破，又屢啟於公。公疑其有異色，先遣迎看，因自留之，羽心不自安。此與魏氏春秋所說無異也。) Shu Ji annotation in Sanguozhi vol. 36. ↑ (初，羽隨先主從公圍呂布於濮陽，時秦宜祿為布求救於張楊。羽啟公：「妻無子，下城，乞納宜祿妻。」公許之。及至城門，復白。公疑其有色，李本作他。自納之。) Huayang Guo Zhi vol. 6. ↑ (蜀記曰：初，劉備在許，與曹公共獵。獵中，衆散，羽勸備殺公，備不從。及在夏口，飄颻江渚，羽怒曰：「往日獵中，若從羽言，可無今日之困。」備曰：「是時亦為國家惜之耳；若天道輔正，安知此不為福邪！」) Shu Ji annotation in Sanguozhi vol. 36. ↑ (臣松之以為備後與董承等結謀，但事泄不克諧耳，若為國家惜曹公，其如此言何！羽若果有此勸而備不肯從者，將以曹公腹心親戚，寔繁有徒，事不宿構，非造次所行；曹雖可殺，身必不免，故以計而止，何惜之有乎！旣往之事，故託為雅言耳。) Pei Songzhi's annotation in Sanguozhi vol. 36. ↑ (蜀記曰：龐德子會，隨鍾、鄧伐蜀，蜀破，盡滅關氏家。) Shu Ji annotation in Sanguozhi vol. 36. 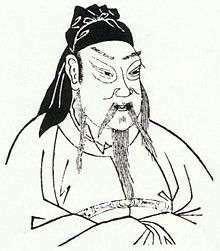 1 2 The Zizhi Tongjian stated that Guan Yu was captured and executed in the 12th month in the 24th year in the Jian'an era (196–220) of the reign of Emperor Xian of Han. Quote from Zizhi Tongjian vol. 68: (... [獻帝建安二十四年（己亥、二一九年）]十二月，璋司馬馬忠獲羽及其子平於章鄉，斬之，遂定荊州。) This date corresponds to sometime in January 220. ↑ Dubs, Homer H. (1938). The History of the Former Han Dynasty by Pan Ku. Vol. One. "Chapter IV, Appendix I, Standard Weights and Measures of Han Times", pp. 276–280 Baltimore. Waverly Press, Inc.; Dubs, Homer H. The History of the Former Han Dynasty by Pan Ku. Vol. Three, p. 160 n.7. Ithaca, New York. Spoken Languages Services, Inc.
↑ (名與實爽曰繆。) Yizhoushu vol. 6. ch. 54. ↑ Brunnert, H. S.; Hagelstrom, V. V. (2013). Present Day Political Organization of China (reprint ed.). Routledge. p. 494. ISBN 978-1-135-79795-9. ↑ 顏清洋 (Yan, Qingxiang) (2006). 從關羽到關帝 (From Guan Yu to Guan Di) (in Chinese). 遠流出版 (Yuanliu Publishing). p. 277. ISBN 957-32-5763-7. ↑ You, Zi'an (2010). 敷化宇內：清代以來關帝善書及其信仰的傳播 (pdf). 《中國文化研究所學報》 Journal of Chinese Studies No. 50 - January 2010 (in Chinese). Hong Kong: The Chinese University of Hong Kong. Retrieved 13 June 2013. ↑ Roberts, Moss (1991). Three Kingdoms: A Historical Novel. California, USA: University of California Press. p. 970. ISBN 978-0-520-22503-9. ↑ "Monumental 1,320-Ton Sculpture of Chinese War God Watches Over the City". 2016-07-19. Retrieved 2016-07-20. Luo, Guanzhong. Romance of the Three Kingdoms (Sanguo Yanyi). Wikimedia Commons has media related to Guan Yu.